Reading about American artist James Luna’s travels around the country brings to mind of a couple of earlier artistic visitors to New Zealand. 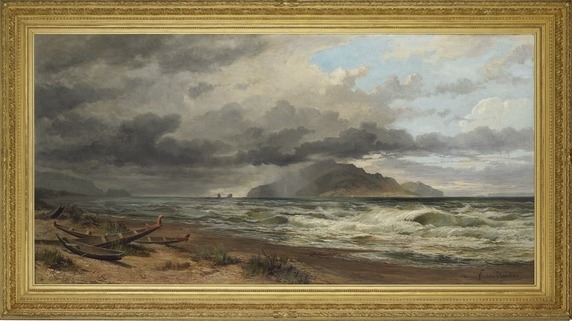 Nicholas Chevalier, the Russian-born, Australian-domiciled Swiss painter made two visits to New Zealand in the 1860s. The first, in 1865, was sponsored by the Otago Provincial Council. Not to be outdone, the Canterbury Provincial Council stumped up additional funds so Chevalier could paint that province too. Chevalier returned to New Zealand three years later, this time to Wellington. The results of that trip included watercolours like this and this, and ultimately the magnificent painting shown above. It was produced many years after his visit and that may explain the rather unusual conjunction of Kapiti Island with Cook Strait. The painting was in a pretty sorry state when Te Papa bought it 120 years later and you can read about the conservation treatment it underwent here. It’s now on show in Toi Te Papa. Another trans-Tasman traveller who had a memorable stay was Tom Roberts. The Australian impressionist arrived on the Monowai in March of 1900. The ship was quarantined to Matiu/Somes Island for a week as authorities were worried about the possibility of bubonic plague arriving from Sydney. 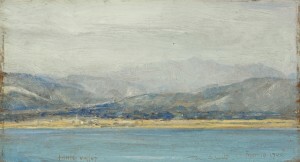 Roberts used the time productively, painting the above view looking up the Hutt Valley and this one of the island. We bought the two paintings at auction a few years ago. Neither has been shown at Te Papa yet but, like the Chevaliers, they will be featured in the forthcoming book on the art collections.